The Conference will be held in the new auditorium of the Faculty of Mathematics and Computer Science in the Chopin 12/18 street in Toruń, some 5 minutes' walk from the historical city centre. 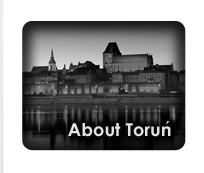 The city of Toruń (see also Virtual Toruń), founded in 1231, is a treasure of Polish and European history, most importantly, famous for being the home to Nicolaus Copernicus. The city is famous for its remarkable monuments which have won the designation of the cultural heritage of mankind from UNESCO and is visited by a large number of tourists each year.